Hello everyone, this is my entry for the Manga Moveable Feast this month. You can view more reviews and essays on Yotsuba&! and other kid-appropriate manga over at Good Comics For Kids. Yotsuba&! 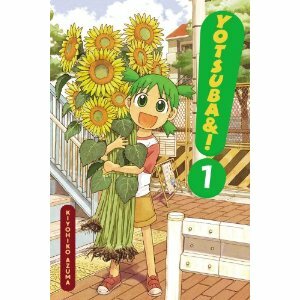 volume 1 by Kiyohiko Azuma is about a young girl, Yotsuba, and her father, who have just moved to a new neighborhood. As they get adjusted to their new location, they quickly become friends with the girls who live in the house next door, especially Fuuka, the middle daughter. The volume consists of short stories and adventures involving Yotsuba and either her father, her father’s ridiculously tall friend Jumbo or the girls next door. 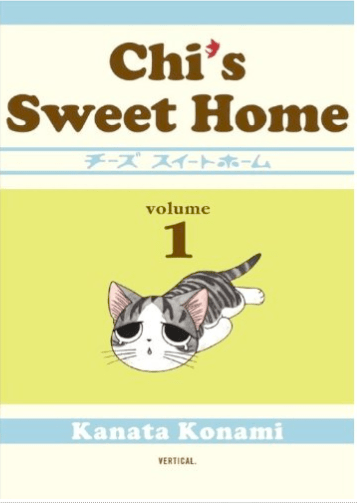 Chi’s Sweet Home volume 1 by Konami Kanata is the story of a lost little kitten who gets rescued by a young family, despite the fact that they can’t have pets in their apartment. Chi and the family adjust to each other and the readers are treated to short stories about being housebroken, wanting to claw the furniture, running away and various other things that pets do. I have no problems with the stories or the art in either Chi’s Sweet Home or Yotsuba&! In both manga, the art is clean and simple, yet detailed enough to interest the reader in the backgrounds and not just the characters. In Chi’s Sweet Home, the manga is in color, giving it a neat, but watercolor-like feel. (Oh, the magic of a skilled hand with Copic markers.) Both manga feature succinct storytelling that allows for those little moments that convey simple actions and emotions effectively while not getting too hung up on those moments either. And, most importantly, these manga are both perfectly appropriate for kids. The raunchiest it gets is in Yotsuba&! when Jumbo tries to flirt a little with Asagi, the eldest daughter, makes some light joke about being comfortable “in the buff” and calls her attractive. Despite both these manga being appropriate for children, I feel like Yotsuba&! isn’t a manga for children at all. Instead it is a manga for adults who want to read about children being cute. Basically it’s like a Japanese version of Kids Say the Darnest Things. While this is all perfectly fine for anyone who’s got a few years between them and being a kid, I’m just not convinced most kids would be entertained long enough to keep reading. For one, I can see older kids reading this and going, “Why’s this girl so weird/stupid/dumb?” and walking away. Younger kids (kids around her age) won’t keep reading because they don’t understand or because Yotsuba just isn’t that funny when you’re that age. They won’t get the jokes about global warming or why it’s funny that Yotsuba cannot pronounce it. In the end, Yotsuba is a comic that is meant for adults to laugh at the cute things that young children do, specifically this little oddling that Azuma has created. I’m not claiming to be an expert on what kid’s will understand, relate to and want to read, but the intended audience of this manga is really clear to me. It jus t also happens to be a manga that you can safely give to kids. Chi’s Sweet Home, on the other hand, is definitely more intended for kids despite having run in a seinen manga magazine. It is nothing but the funny, simple moments of a kitten and it’s adopted family. It’s meant for anyone to enjoy so any kid who likes animals will love it. Plus there are enough visual cues for children to laugh at or relate to than in Yotsuba&!, which is one of the charm points in this manga: Chi’s hilarious and cute expressions. Even if you read this manga to a three year-old, I’d bet they’d giggle at Chi’s teary-eyed faces and cute kitten antics. At the same time, I’m a little bit dissatisfied with editorial decisions both manga. Yen Press has a habit of subtitling in sound effects with both the romanization of the text and the English-language sound effect. It’s nit-picky, I know. But it’s bothered me in every single Yen Press book I’ve read and will probably continue to bother me in the future. As for Chi’s Sweet Home, there’s heavy use of “baby talk” in the form of the letters ‘r’ or ‘l’ being turned into ‘w’, amongst other things. While this would work if you were reading aloud to your kid, wouldn’t a young reader get tripped up by the misspelling? Also, the “baby talk” is inconsistent and rather jarring when it appears. I found myself getting yoinked out of my reading experience and frowning every time the “baby talk” came back again. The manga would have been perfectly fine without it. Also bothersome to me was the price for Chi’s Sweet Home. While I understand why it’s priced higher than regular manga with the beautiful color pages, if someone less familiar with manga came along, they might find it too prohibitive for such a small book. Or worse, a parent shopping in a children’s section would probably pass it over for a higher quantity of less expensive children’s books. These are hard economic times and I imagine parents are some of the people who are the most worried about how they spend their money. Surely there might have been a way to bring the cost down a few dollars? I know Vertical’s not been having any problems selling the book, so maybe a lower price could have been possible without hurting the publisher too much. Either way, I recommend both manga for anyone who wants a good laugh. Chi’s Sweet Home is great for kids, adults and cat lovers of all ages and the quality of the color pages is fantastic. Yotsuba&! is a fun read for the adults in the house and although it may or may not capture your child’s interest, you could put it in the kids’ reach without any worries. This entry was posted in manga, opinion, reviews and tagged Chi's Sweet Home, Good Comics For Kids, Kiyohiko Azuma, Konami Kanata, manga, Manga Moveable Feast, Vertical, Yen Press, Yotsuba&!. Bookmark the permalink. In the Japanese version of Chi, she speaks with a lisp.. and so I believe that is editorial decision to make translation- more authentic. Japanese culture loves anything that is cute… and often certain words, and tones are considered cute is with a lisp, as barbaric as that sounds. Interesting… I still find the use of it inconsistent, however. Which annoyed me when I got surprised again and again by Chi’s speech. I spoke with Vertical Editor’s and he has the same feeling.. but Chi is such a fantastic title.. either in Japanese or not.. that I overlook a lot of things – for the sake of a cat! Interesting to know that even Vertical editors think the baby talk is inconsistent… I know the decision could have been made to extend the baby talk throughout the book, I wonder what the better choice could have been. I almost didn’t buy Chi’s Sweet Home because of the price, and the baby-talk bothered me, too. But then, when I made my boyfriend flip through it, he thought it was super adorable that she spoke in baby-talk. Go figure. I didn’t really flip through it much before buying, but I have to say I was a little bothered by the price tag in the bookstore. There just must’ve been some way to slash the price by a dollar or two… $14 is pretty steep.